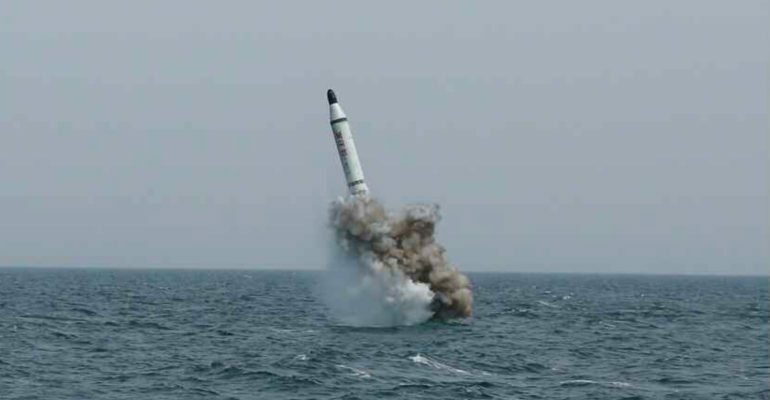 On May 9th, 2015 a KNCA report claimed North Korea to have test fired a submarine-launched ballistic missile (SLBM). North Korea has dubbed this SLBM the Bukkeukseong-1 (Polaris-1 or KN-11). The range of the missile is estimated around 900km, however, it was reported by 38 North to be comparable to the original Soviet single-stage liquid-fuelled SLBM (R-27). The Soviet-era SLBM R-27 had a range of 2,400km and could carry up to a 650kg payload. South Korean officials have noted that the missile traveled 100-150 meters in the air when ejected during the May 9 test. The unpredictability of North Korean’s regime has forced the U.S. to reassess their posture in the region. Analysts contend there is a possibility of photo editing and video manipulation of the test launch. North Korea has been known to doctor military photos, and the photos of the test-fire provided by the KCNA can not be verified for validity. North Korea considered adding SLBM’s to their offensive arsenal in the late 1980’s when it developed Scud (tactical ballistic missiles developed by the Soviet Union) manufacturing ability. However, North Korea’s existing WHISKEY and ROMEO class submarines could not be modified to carry SLBM’s. In September 1993, North Korea purchased 12 decommissioned Russian FOXTROT class patrol submarines and GOLF II class ballistic missile carrying submarines. North Korea examined the design of the decommissioned Russian submarines, in particular the GOLF II class submarine, since it possessed components of the missile launch systems. The FOXTROT and GOLF II class submarines were scrapped due to their aged condition. In the early 2000’s, North Korea continued research and development into incorporating ballistic missile launch technology on sea-based systems. North Korea engaged in new naval construction and modernization programs where SANG-O II coastal submarines and ROMEO patrol submarines were subsequently produced. North Korea’s current submarine fleet is made up of around 70 Soviet-era submarines. In 2010 satellite images revealed the North Korean Sinpo South Shipyard as a potential test stand for launching ballistic missiles from submarines, or a shipboard for vertical launch ballistic missiles. Using images that surfaced early in 2015, U.S. analysts observed that there had appeared to be one or two vertical launch tubes on the conning tower of the North Korean SLBM. The U.S. intelligence community has assessed the supposed SLBM test fire as a compressed-gas ejection system test instead of a launch from a submarine. Experts contest that North Korea requires years of further SLBM development before they could launch a SLBM that could threaten the United States. Dr. Choi Kang, Vice President of the Asan Institute for Policy Studies believes North Korea could have an operational and deployed SLBM system by 2025. If North Korea were able to combine a future operationalized SLBM with a miniaturized nuclear device, it could produce a sea-based deterrent enhancing its nuclear threat capacity. North Korea’s ICBM forces, which consists of an un-tested road-mobile KN-08, makes North Korea’s nuclear arsenal potentially more survivable. Full nuclear SLBM capability could provide North Korea with a survivable second-strike capacity and the potential to retaliate against adversaries. North Korea’s increased nuclear capability could escalate the risk of nuclear proliferation amid rogue states and non-state actors. With North Korea’s belligerent and dangerous behavior, regional states, such as Japan, South Korea, and China, are growing concerned about the growing nuclear threat in North Korea. Deployed North Korean SLBM’s could lead to an offensive and defense arms race on the Korean peninsula which would result in decreasing security and increasing the potential for conflict. Satellite pictures of the submarine used in the alleged test firing is estimated at 65.5 meters and is likely a diesel-electric powered ballistic missile submarine (SSB), also known as Sinpo class. The SSB is handicapped by its range and endurance, and can not outrun U.S. attack submarines. A SSB could wait in its pre-designated position and remain submerged by running on batteries, but an ASW target can locate the SSB since it would have to surface to recharge its batteries. North Korea lacks long-range power projection capabilities to protect the SSB against ASW forces. Nuclear-powered ballistic missile submarines (SSBNs) are traditionally hard to detect and counter through pre-emptive strikes because of its infinite power and underwater endurance. SSBN’s can easily strike from a distance beyond the adversary’s anti-submarine warfare (ASW) coverage. If North Korean possessed SSBN’s, the SLBM threat would be heightened because they are nearly invulnerable to preemptive strikes. As SLBM’s approach the coastline of the target country, warning times for missile defense systems decrease and the first warning would be when radar detects the missile in the air. If KN-11 is similar to the Soviet R-27 and operational, it would require the Sinpo class submarine to be at sea for 60-90 days before it could launch an attack within range of the United States since North Korea lacks a mature ICBM capability. Seoul is considering incorporating a US terminal high-altitude area defense (THAAD) system to create a layered defense in defending North Korea’s spectrum of missile threats. A medium to upper range missile defense system would enhance South Korea’s early warning defense for a potential missile threat. Click here to see a list of the KN-11 tests. Adm. James A. Winnefeld. (2015 May) Remarks at the Center for Strategic and International Studies. CSIS. Washington, D.C.
 Old Soviet Submarines Prove to be Tough Sell,” American Metal Market, October 30, 1992, p. 9; Furukawa, Tsukasa. “Subs Tracked in North Korea,” American Metal Market, February 10, 1994, p. 11; Furukawa, Tsukasa. “Subs for N. Korea Called Gutted, Rusted,” American Metal Market, March 4, 1994, p. 11; and Furukawa, Tsukasa. “Japan Government Brakes Sub Breaks,” American Metal Market, May 17, 1994, p. 10.